Trees add priceless value to your property. They provide shade, screening, winter windbreaks, not to mention a mature beauty to enjoy throughout the year. Just like your home, trees are one of the biggest investment in a property. They can last for many decades as they overshadow some of life’s best memories at home. It’s no surprise why people love their trees so much. As trees grow, they commonly face certain challenges that lead Lehigh Valley property owners to enlist the help of tree trimming services in Allentown, Bethlehem, or Easton, PA.
Tree branches could grow and hang too low, break in storm conditions, or the overall canopy (or crown) of the tree can become too full. As limbs hang too low over a lawn or roof, or block certain views, a Certified Arborist will enlist a tree pruning technique that will attractively prune certain branches or parts therein to give a raised appearance maintaining the natural shape of the tree vs. the resulting ugly stubs from an ameteur tree trimming. Once and awhile, some limbs within a tree may start to die-back for various reasons. 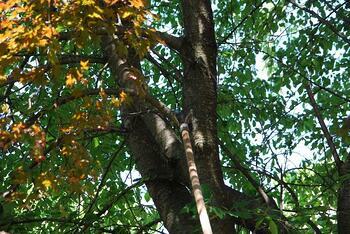 As this decay spreads down the branch and into the tree’s trunk, it can create major concerns. Crown cleaning is a tree pruning technique that selectively removes these declining branches and also those that may have been damaged in a storm, to reduce the chance of the decay spreading further. Depending upon the species of tree, it’s a good idea to have tree trimming done every 3-7 years to thin out the crown (canopy) of your tree. As branches grow, they can direct themselves to rub against other desired branches and create potential points of future decay. Certified Arborists can selectively remove 25-30% of the growth within your trees to prevent these issues, while still maintaining beautiful specimens. It seems that anyone brave enough to climb a tree with a chainsaw and tow a chipper behind a truck can call themselves a tree trimming service. However, tree pruning is both an art and a science. It’s important to make sure that you find a professional that understands this and will not do irreversible damage to your trees. Our team of Certified Arborists have to not only pass an extremely difficult test for their credentials, but they have to maintain them each year by attending trainings about improving their work skills and safety procedures. We take our jobs very seriously, and your trees are dear to our hearts. 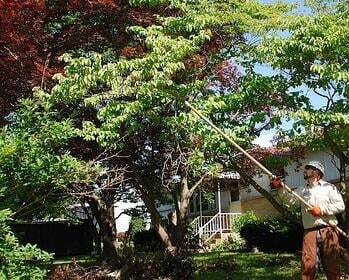 We invite you to contact us for a free tree trimming and pruning consultation. We can walk your property with you, give you recommendations, and explain what’s involved with the process of protecting some of your property’s greatest assets—your trees!